Bromfield High School students painted a rock on school grounds that had been defaced with hate speech. 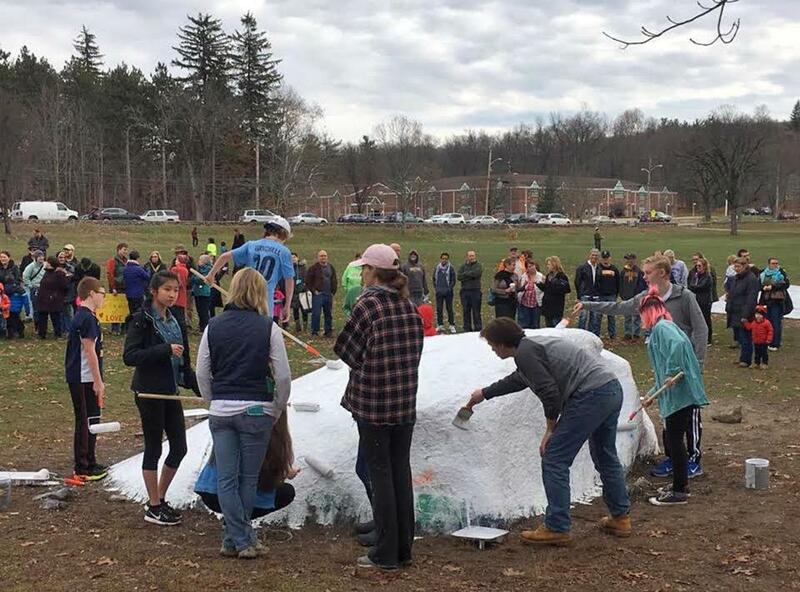 Students from the Bromfield School in Harvard gathered at their school Saturday afternoon armed with cans of white paint and rollers to repaint their beloved rock that was defaced with hate speech and offensive symbols. The rock that sits in front of the school was vandalized Friday with swastikas, anti-Semitic symbols and words, drawings of genitalia, and profanities, Harvard police said in a statement. Bromfield, which has 700 students in grades six to 12, is one of two public schools in the town located about 45 miles northwest of Boston. The school was not open when the vandalism happened, and students are still on Thanksgiving break. Superintendent Linda Dwight said it was wonderful to see students rally the community to come together to repaint the rock. “It felt like a way to minimize the hate that had taken place just the day before,” she said by telephone Saturday night. The rock usually is a place where seniors express themselves, such as celebrating a school team’s victory, said Emma Franzeim, a Bromfield graduate who worked with students to organize the painting. About 50 students, teacher, parents, alumni, and town residents gathered to watch students paint the rock white, she said. Some used paint rollers with a long pole to lean over the rock. Others scaled the rock and painted it while perched atop. Franzeim created a GoFundMe campaign called “Paint the Rock!” Friday to raise $2,000 to pay for the painting materials. As of Saturday afternoon, the campaign had raised $1,245 of its goal. Students will return Monday to paint a design on the rock, Franzeim said. Police said the department is working with the superintendent and that the Massachusetts Attorney General’s Office will help investigate the vandalism. Dwight said there is an assembly planned for Monday to help students feel safe and celebrate painting the rock. The goal is to foster a feeling of unity, she said.